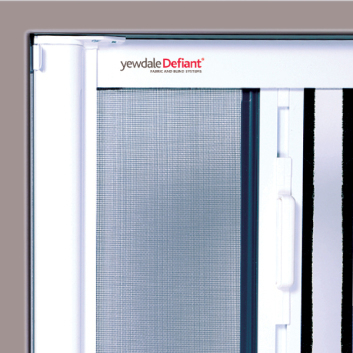 The YewdaleDefiant F40D is a horizontally retractable double door insect screen with an advanced slow-rise spring control. This ensures smooth and quiet operation whilst the white metal universal brackets secure the top-fixed powder-coated extruded aluminium cassette and side guide channels. The rot-proof PVC coated fibreglass mesh is locked into the barrel and bottom bar profile. The YewdaleDefiant® F40D horizontally retractable double insect screen unit with advanced slow-rise spring operation as manufactured by Yewdale, +44 (0)1268 570900. 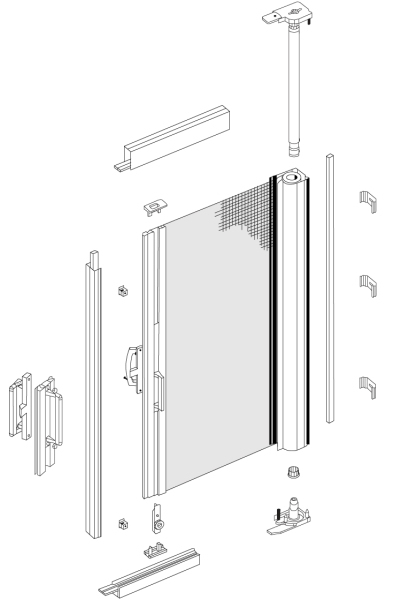 Vandal resistant spring and decelerator mechanism is housed within white powder-coated aluminium cassette. Roll-up flame retardant, rot-proof PVC coated fibreglass mesh held securely inside guide channels and bottom bar. Supported by sturdy metal brackets.